﻿ 3 Superfoods For Healthy Digestion - I AM Co.
Is your digestion causing you discomfort, bloating or lethargy? It may be time for you to undergo a bit of a reset. A healthy gut is the foundation of a healthy body and a healthy mind, so keeping it working efficiently is key to your overall health and wellbeing. There are many natural ways to lighten the load on your digestive system, reducing toxic build-up and re-energising from the inside out. Here are our top picks of superfoods that can be easily included in your diet on the daily to help achieve a clean, clear digestive system. Psyllium is the husk of the seed from the Plantago plant. When submerged in water, psyllium plumps and forms a gel-like consistency that will help keep everything moving to maintain regular bowel movement. It can be thought of as a natural laxative that is very gentle on your digestion. Psyllium can be so powerful once its gel has been formed, therefore make sure you start out with a low dose and drink plenty of water during and after to support the gut cleansing. Psyllium husk is the key ingredient found in the Ceres Organics Functional Fibre raw wholefood blend, made up of 63% psyllium and 37% chia. This blend is super rich in soluble fibre which, when taken as part of a varied diet, can help maintain healthy digestion and even be taken as a natural prebiotic dietary supplement. These tiny power seeds are the perfect gut cleansers when soaked in water, at which point they form a gel-like consistency, much the same as psyllium. They work to flush out the stomach and are specifically beneficial for those with blocked digestion. 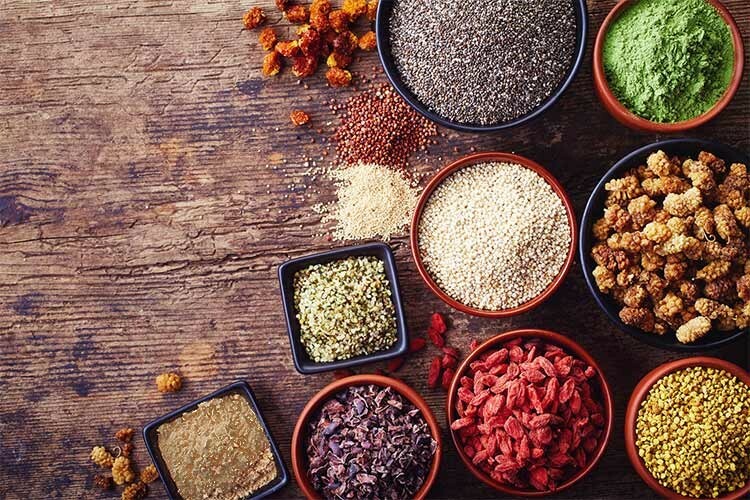 In addition to these digestive qualities, chia seeds are a rich plant-based source of omega-3 fatty acids, which provide amazing benefits for your hair, skin nails and even mental health. On top of all of this, chia seeds are super versatile and can be included in your morning smoothie to give it a lush thick consistency, made into a flavoured chia pudding or sprinkled on top of your summertime salads. 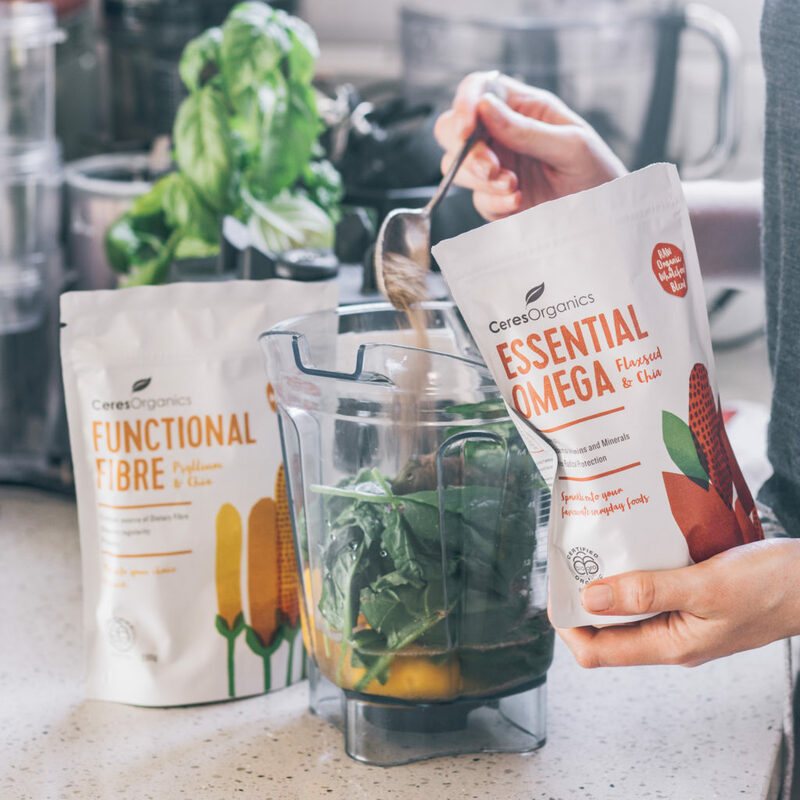 Chia is a key ingredient found in both the Ceres Organics Functional Fibre and Ceres Organics Essential Omega raw wholefood blends. It provides a powerhouse of nutrients that are great for your health and wellbeing, best consumed in your diet at least once each day. Flaxseed provides a double whammy of fibre because it contains both soluble and insoluble fibre. It also has powerful antioxidant qualities, a high content of omega-3 essential fatty acids and adds a yummy nutty flavour and consistency to your smoothies, oats and savoury recipes. Through these healthy attributes it has also been linked to reducing risk of heart disease, cancer and diabetes. Flaxseed is the second functional ingredient found in the Ceres Organics Essential Omega raw wholefood blend. This special blend provides over 6000mg of omega 3 per serve, together with protein and essential nutrients, including Vitamins B1 (Thiamin) & B3 (Niacin).